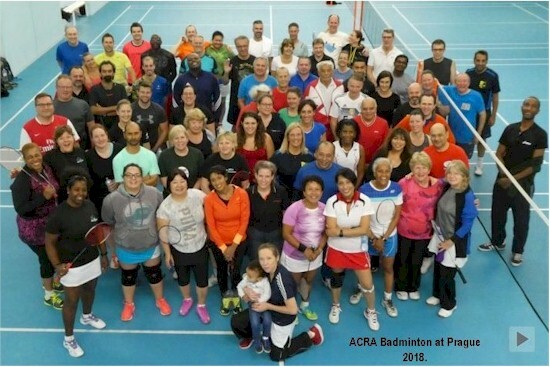 The ACRA Annual Badminton tourney was held in Prague on October 11 - 13, 2018. Here is a photo of the crowd who enjoyed the competitions. Several photos of the winners have been posted on the ACRA Facebook page. Airwomen from 17 Wing inspire at Girls in Aviation Day. Once a year, Royal Canadian Air Force women from 17 Wing Winnipeg, Manitoba, are superheroes for a day. Once a year, they show young girls that anything is possible. Once a year, they inspire the next generation of women during the Winnipeg Girls in Aviation Day. The 2018 sold-out event was held on October 13 at Winnipeg’s Royal Aviation Museum of Western Canada. There, 150 girls learned about aviation and aerospace careers and had the chance to meet successful female role models. The girls, aged 8 to 17, heard inspiring female speakers such as the Honourable Rochelle Squires, Minister of Sustainable Development and Minister responsible for the status of women. Kendra Kincade, an air traffic controller, gave a presentation; she is the founder of Elevate Aviation, a non-profit organization that helps women across Canada find economic security within the aviation industry. This facility will allow Air Canada to further enhance their operational capabilities and reinforce their commitment to Alberta’s capital city. The new facility is expected to open in September 2019. (Source: ACDaily & www.newswire.ca - October 25, 2018. 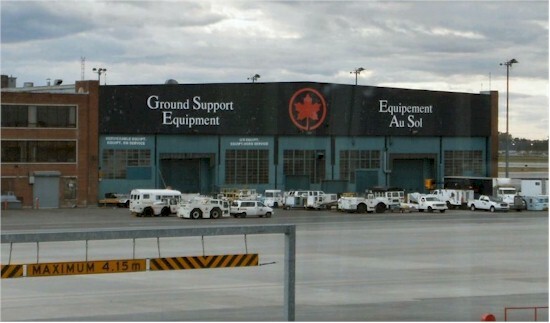 In NetLetter #1402 we had two photos of employees at the Air Canada Ground Support Equipment at Dorval. Mike Vieira has sent us these photos and information. 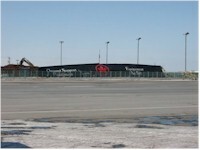 Hangar 1 was converted into a GSE shop in the '60s after Air Canada built hangars on the other side of the Montreal Airport which became the Air Canada base. 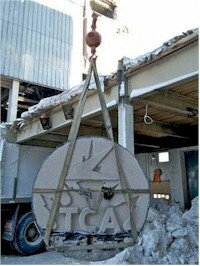 You can see a part of the TCA sign on the left side of the building near the top (photo was taken around 2005). 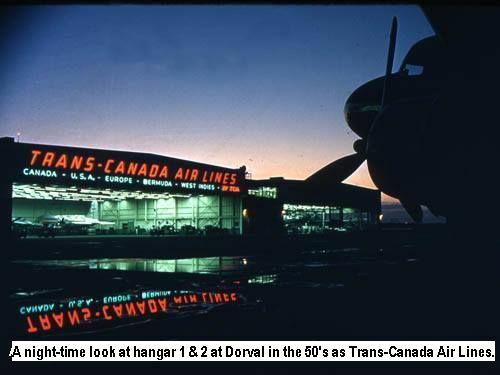 A night-time look at hangars 1 & 2 at Dorval in the 50's as Trans-Canada Air Lines. Here they are removing 1 of the 2 TCA signs that were on the building columns. The TCA sign is lowered to the ground, this one was covered in roofing tar when they expanded the building between hangar 1 & 2. It still sits in our new GSE shop waiting to be cleaned and mounted... somewhere!! 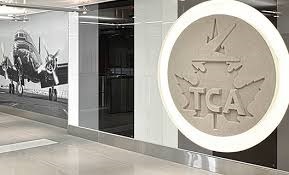 Here's the location of the other TCA sign that was saved, cleaned and installed at the new SOC center in Brampton Ontario. The end of an era with many good memories. The hangar roof sits on the ground. During Austrian Airlines flight #72 on September 27, 2018 sector VIE - YYZ, I took this photo of chef taking orders in Business class. 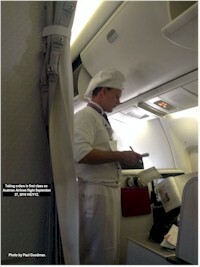 Certainly did not see him taking food orders from those poor souls at the back of the plane...Paul Goodman. 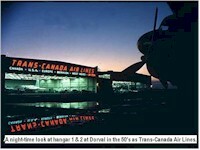 1984 - June 16 - Direct flight between Victoria and Toronto commenced. Here is the cover of the enRoute magazine issue April 2012. 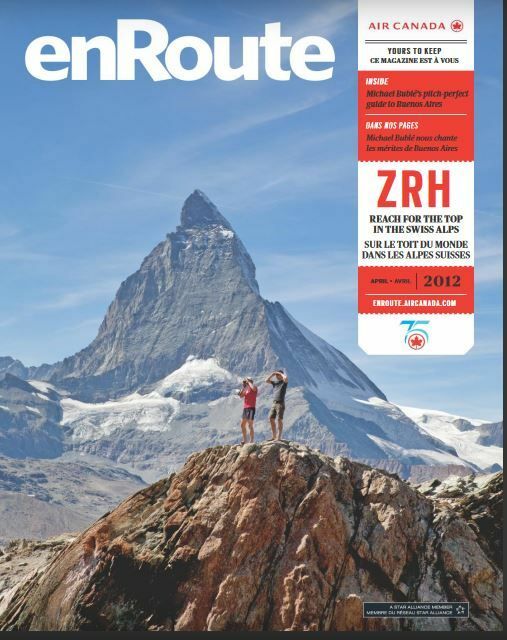 Climb every mountain: The view from Rotenboden, Zermatt, on the way to the Mont-Rosa-Hutte. 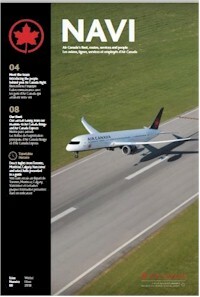 Air Canada NAVI magazine series was launched in March 2017. On the left, we have the issue for the Winter of 2017 cover page. Louis Stoyanoff, Robert Mans, Richard Weltham, Scott Hannon, Abdull Hraiche, Robert Penyk, Feroze Anis, Arin Goswami, Court Edeburn, Daniela Provato, Dean Stoddart, Magdalene Kuzevc, Michael Tomasevic, Jennifer Young, Brian Murray, Mark Storoschuck and Muna Bahumaid. 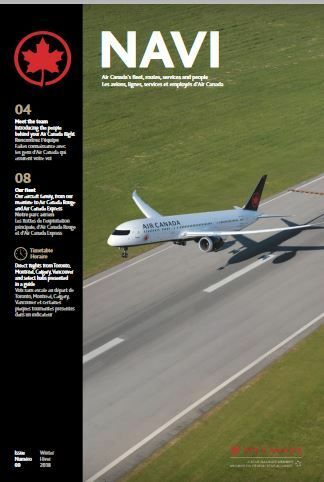 To better the requirements of Air Canada's new business model and to support its strategy to provide value and simplicity to its customers, a company-wide initiative has been launched to replace our current RES Ill system. Labelled 'Athena' for the goddess of ingenuity and creativity, this project will involve building a completely new system based on practical solutions to simplify the process. On March 22, 2006, NASA fired three Micro-satellites into space over the Pacific Ocean. Nothing strange in that, but the satellites were carried and dropped by a Lockheed L-1011 jet at 39,000 feet. So what? Well, it turns out that the aircraft was formally from the Air Canada fleet, none other than CF-TNJ fin #510 c/n 1067, having started its career on March 18, 1974. In 1990, the company parked the aircraft in Marana, Arizona. In May 1992, Orbital Sciences obtained the aircraft and pulled it out of storage in May 1992 and named it "Stargazer". For more see Wayne's Wings article from NL #1377. Michael Tremblay, Director Call Centre/Customer Relations visited the Winnipeg Call Centre in the Fall of 2010 to celebrate 325 years of Air Canada service. Below, left to right: Danilla Brunel, Michael Tremblay. Bruce Hambleton, Diane Schille, Carmen Stoyko, Margot MacDonald, Doris Gudz, Cade Coghill. 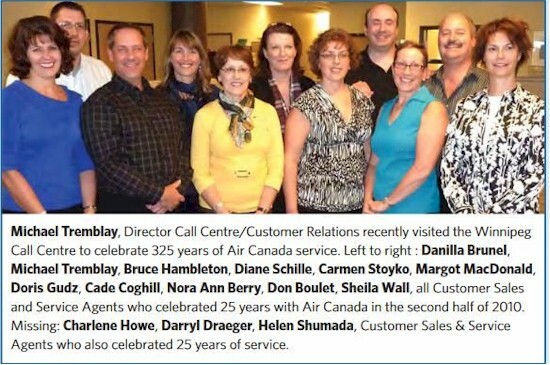 Nora Ann Berry, Don Boulet and Sheila Wall, all Customer Sales and Service Agents who celebrated 25 years with Air Canada in the second half of 2010. Someone had to answer the phones, so missing from the photo are Charlene Howe, Darryl Draeger and Helen Shumada; Customer Sales & Service Agents who also celebrated 25 years of service. A new chapter of the Pionairs was recently established in London, Ontario. Bruce Wrigley, a former Passenger Sales Representative from Toronto, greeted the 46 retirees at a luncheon held in a quaint local restaurant. Included in the group were Nancy Walchuck, president of the 'Pionairs' and her husband Merv. Nancy outlined some of the activities of the 'Pionairs' highlighting the upcoming annual meeting in Anaheim. Pat Tapson, Manager, London, Ontario, was unable to attend but Tony Mcleod, Customer Service Manager was on hand to extend a hearty welcome. He encouraged all 'Pionairs' to join the very active local Air Canada Recreation Association and invited them to participate in the Hackers' Golf Tournament and Bar-B-Q planned for August 9, 1984. The seventh Annual General Meeting of the Pionairs was held at Anaheim, California held May 10-12, 1984. Close to 500 members and guests were in attendance, welcomed by President Nancy Walchuk. Current executive was Donald McFarlane, Secretary; Kay Napolitano, Treasurer; Norm Donnelly, 2nd VP; Gord Smith, 1st VP and George Fox, Immediate Past President. Also present were two of the founding members, Martin Betts and Emily Coxon. Some changes in the directorship of the various Pionair districts were announced. Don Jarvis resigned in Calgary and replaced by Gord Sanders. In Winnipeg, Beth Ferguson resigned and was replaced by Mike Lewicki. In attendance was Bruce Wrigley, the new director at London, Ontario, Evelyn Desjardins, Montreal; Bob Jeffs, Toronto; Tony Bruneau, Halifax. Unable to attend were Mary Young, Ottawa; Doug Armitage, Vancouver; Roger Alain, Florida and Tony Butler, Victoria. At the conclusion of the meeting, it was unanimously agreed that the 8th AGM will again be held in Anaheim. ACRA gets down to business. Presidents of their representatives of the Air Canada Recreation Association gathered in Montreal to discuss a number of employee activities with Harold Miloff, Director Employee Affairs and Services, Gail Ellis, Employee Services Coordinator, and Jim Whitelaw, Senior V.P. Human Resources. They took time off from their meetings to talk and be photographed with then-President Claude l. Taylor. In our photo shown back row from the left are: Jim Miller, Toronto; Robin Parsons, London; England; Bernice Zasada, Winnipeg: Diane Drury, Montreal; Gary Hughes, Thunder Bay; Claude Taylor; Cory Smith, Los Angeles; Bernie Curwin, Moncton; Bob Bateman, Saskatoon; Bernie Allandyce, Vancouver and Neil Stephenson, Regina. Front row, from the left. are Johnny Gaudreau, Sept Iles: Herb Metzler, Frankfurt; Pauline Guest, Edmonton; Rhonda Manore, London, Ontario; Duncan Butchart, Calgary; Winston MacDonald, Sydney and Mary Haines, Halifax. Missing from the photograph are: Joe Hancock, San Francisco; Randy McNiven, St. John's; Wilfred Hackey, Quebec City; Jim Batten, Ottawa and Glenna Hayes, Saint John. 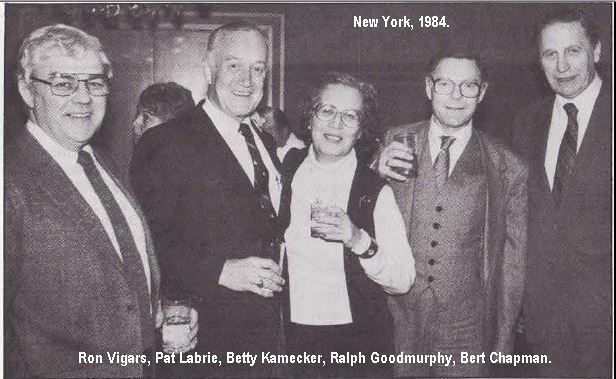 Some members of the staff of U.S. and Southern Region office when it was still located on Los Angeles, got together in New York. From the left are Ron Vigars, Regional Aircraft Safety and Services Manager, Pat Labrie, Vice President, U.S. and Southern Region; Betty Kamecker, Executive Secretary; Ralph Goodmurphy, Regional Financial Manager and Bert Chapman, General Manager, South. The regional offices relocated to New York in 1975. After World War 1 Britain had a surplus of warplanes that were used to jumpstart its commercial air industry. In 1924, the government gathered together the few struggling British air companies to form Imperial Airways. They not only shuttled passengers but mail all over the globe. We believe the photo shown below is of a Handley W.10, with a similar model (Handley Page W.8b) shown at the bottom. This model held 12 passengers with an open cockpit for the two pilots. 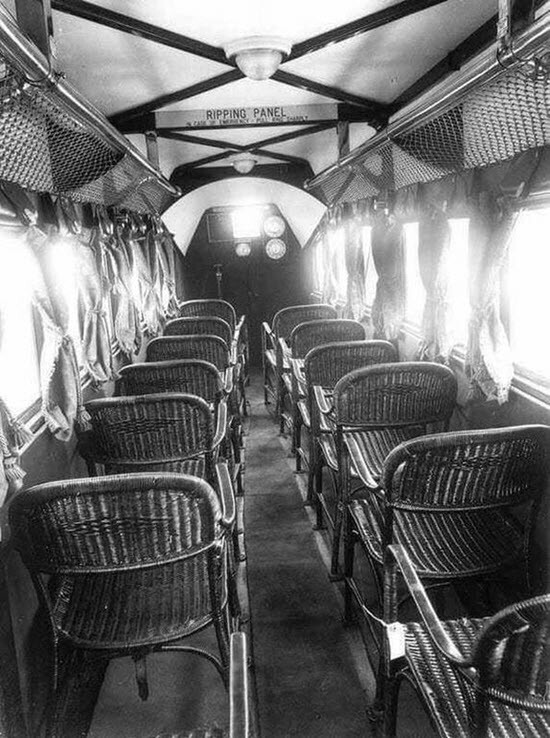 Shown in the first photo below, the seats are made of wicker and I'm not sure how securely they are anchored to the floor. Also, I found it amusing that they show a "Ripping Panel" at the top of the cabin. It reads "in case of emergency, pull ring sharply". which would open up the canvas roof for escape. See https://en.wikipedia.org/wiki/Imperial_Airways for more info. From Air Canada "Horizons" magazine issue dated December 1983. Nordair bounces back into the black. Click here for the Nordair story. Montreal versus London. Canadian Pacific Railway's Ambitions. The following illuminating article appeared in the May 1st, 1941 issue of "American Aviation." 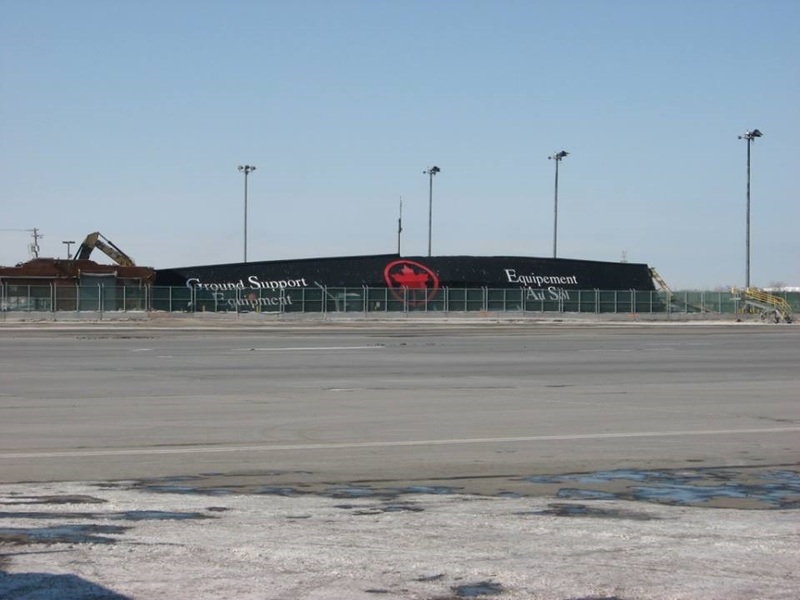 A GIGANTIC air transport development is in the making in Canada which will place this northern neighbour of the U.S. in a strategic position after the war is over as the focal point for air transportation to the Orient, to Europe, and to all of the British Commonwealth of nations. The rising new factor is the Canadian Pacific Railway, which has purchased or acquired control of eight airline companies in Canada, and which today is gaining wide experience in over-ocean flying by reason of its complete control of servicing and operation of bombers being ferried to England. There is even much reason to believe that Canadian Pacific Railway is today in the dominant control of British Overseas Airways and that Montreal will become the centre of British commercial air services when the war is over. 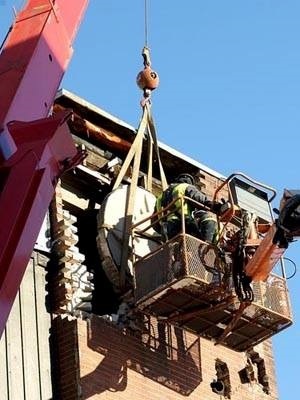 The extent to which C.P.R. has forged its way to the top as the largest potential British airline operator has not been thoroughly recognized outside of a small circle associated with C.P.R. 's air service department. Development of an extensive air service department by C.P.R. is a new phase of the long rivalry between this company and the Government-owned Canadian National Railway, which owns Trans-Canada Air Lines. 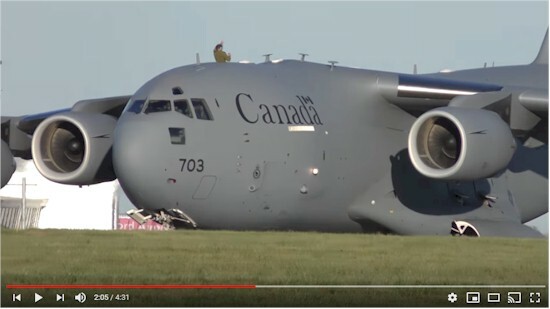 I recently came across the video below on YouTube of a Royal Canadian Air Force Boeing C-17 on departure from Leeds Bradford Airport last May. I was amused by the cheerful waving of the soldier to the crowd while the aircraft is taxiing to the approach of the runway. It seems to lift very gracefully into the air for such a large aircraft. The official Canadian designation for the aircraft is CC-177 Globemaster III. They joined the RCAF fleet in July 2007 to perform military and humanitarian missions for which leased An-124 Ruslan aircraft from Russia had previously been used. The aircraft featured in the video is registration #177703 which was the third of the original four ordered from Boeing. It is based at CFB Trenton. A fifth aircraft was delivered in 2015. As if it wasn’t enough to be planning to fly a fleet of vintage C-47's above Normandy in June 2019, to commemorate the 75th anniversary of D-Day, the project also includes about 300 parachute jumpers from a variety of historic-recreation groups who aim to honour the veterans of WWII. The jumpers aim to faithfully re-create the historical aspects of their gear and equipment, subject to safety and operational limitations, and certain other liberties are also allowed. The Europe flight departs in May, from Connecticut. The organizers expect to fly about 15 jump sorties in Normandy and Berlin. Farmer Builds Full-Size A320 Replica. When Chinese garlic farmer Zhu Yue had to admit to himself that he would never achieve his lifelong dream of learning to fly, he did what he considered to be the next best thing. The ambitious and apparently prosperous agriculturalist and welder built a full-scale steel model of an A320 in his hometown of Kaiyun. "I hit midlife and realized I couldn't buy one, but l could build one," he said. It's not clear what type of aircraft Zhu thought he might want to buy but the $374.000 he spent on the enormous model of Airbus's bread and butter airliner should have given him a lot of options. Nevertheless, he forged ahead with the complex project, using an 80th-scale model and photos to guide him. The result is a somewhat faithful replica that weighs more than 130,000 pounds. Zhu plans to use the replica as a restaurant where diners will be seated in 36 first class seats. "We will put down a red carpet so every person who comes to eat will feel like a head of state," Zhu said. Bombardier plans to sell the Q400 regional turboprop program to Longview Aviation Capital, parent company of Canada’s Viking Air, which previously acquired the rights to out-of-production de Havilland Canada types. This airline sure is accident prone! A Lion Air Boeing 737-900ER was damaged when the aircraft’s wing struck a pole while taxiing to the runway at Bengkulu Fatmawati Airport, on the evening of November 7, 2018. Flight JT 633, bound for Jakarta Soekarno Hatta Airport, was carrying 143 passengers when the left wing came into contact with a pole at around 6:20 p.m. local time, resulting in a visible tear on the wing’s leading edge near the winglets. No one was injured, and passengers were transferred to another Lion Air flight to Jakarta four hours later. The eight-year old 737-900ER, registered as PK-LGY, and the two pilots were grounded following the incident. The Indonesia Ministry of Transport said it would investigate the cause of the incident and take follow-up measures. Air 500 Limited was a Canadian airline. Founded in 1985 by Dennis Chadala, former Captain, director of marketing and assistant to Carl Millard, of the defunct Millardair. The company commenced operations with a Super Beech 18 Model E, registered C-FTAE that was purchased from Bradley First Air where it had retired from flying the Dew line in Northern Canada. The Beech 18 was originally purchased new by Timmins Aviation. The founder had extensive knowledge of the emergency freight business and the operation of DC-3s, Super DC-3s and DC-4 aircraft due to his position within the inner circle at Millardair. Dennis Chadala created Air 500 Limited on a shoe string, without financing and was the first airline to receive licensing and an operating certificate at Toronto's Pearson International Airport following deregulation of the aviation industry in Canada in 1985. Coastal Airways BC, flying as Royal Airlines, was established in 1931 by Richard Gosse of BC Packers,.Victoria’s Robert Pim Butchart, and J.H. Tudhope, former Commanding Officer of the RCAF Jericho Beach Station. The airline flew passengers and mail with a Bellanca Pacemaker, CF-AND and a Fairchild 71, probably CF-AJP, from The Causeway in front of The Empress Hotel to Vancouver on a passenger/airmail service. The service had a very short lifespan due to practical inexperience and internal dissent. From "Between Ourselves" magazine - Issue dated July 1943. It's up to me to be quick and bright. Check the tanks, and do the reporting. And do all the book work without any light. And once in a while when his landings are rusty. I always come through with “by gosh it is gusty”. All in all I’m a general stooge, as I sit on the right of the man I call “scrooge”.